The Po-2 is a gift Rank I Soviet biplane bomber with a battle rating of 1.0 (AB/RB/SB). It was in the game since the start of the Open Beta Test prior to Update 1.29. 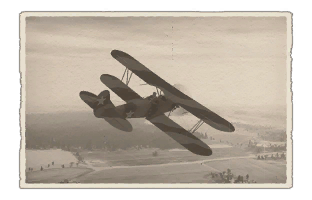 One of the more infamous planes in War Thunder, the Po-2 has a rather affectionate palindrome nickname of "2-OP" from the community for its history in the game. This plane is no longer obtainable unless it is given out during events. 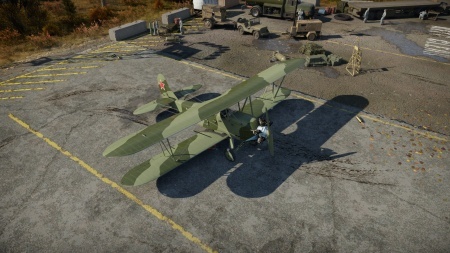 The Po-2 is a very slow aircraft, earning a reputation of affection thanks to its poor characteristics. The Po-2 is about nine times as slow as the jets, and its maximum speed is one third of a good amount of its opponents at BR 1.0. Being so, it is flown mostly for sheer fun with no intent of competitiveness. It does not come without its strengths, though - the Po-2 can carry a very effective bombload, and it can be very evasive against enemy aircraft, thanks to its slow speed and impressive maneuverability. The rear gunner is also decent, being in charge of a very effective machine gun. Unfortunately for the Po-2's enthusiasts, this is also the only armament it has, and the aircraft is so fragile that even a fast-firing gun does not often suffice to rid the Po-2 of a sad fate. Whenever confrontation with fighters is avoidable, one should avoid it and stay safe. When the Po-2 was added, it was originally unlockable by research as a non-premium vehicle. However, it is currently hidden in the tech tree. The Po-2 can still be acquired, though. Once in a while, there is usually an event that rewards the Po-2 for completing it. It should be noted that while it appears before the BB-1 in the tech tree, users who have not unlocked the Po-2 via events or researching it before it was hidden will not see it in the tech tree. Additionally, the Po-2 is separate from the attacker line, and you do not need to have the Po-2 unlocked to research the BB-1 and the aircraft that follow it. If the user has the Po-2 unlocked, this is how it will appear in the tech tree. 13 mm Steel plate in the nose. The Po-2 does at times shine in Ground Realistic Battles, being potentially useful at any battle rating. Its slow speed makes it very easy to dive bomb accurately with, and its 100kg bombs are sufficient to put any tank out of order. A Po-2 pilot can even cause great humiliation to Maus commanders. However, tanks' light machine guns are no small threat for the small biplane, and even tanks' main guns can give it a very bad day, let alone dedicated AA platforms. To avoid this, Po-2 pilots should fly low and try their best to not fly in a straight line, and plan their attacks ahead, looking at the map to see where enemies were marked and inferring the enemies' locations from cap points. Difficult to tail due to low speed. Rear Gunner is armed with one of the best machine guns in terms of RoF in-game. Slow speed helps with accurate bombing bombing. Very capable rudder, useful for quick evasive maneuvers. Very hard to gain altitude. No armour or bulletproof glass protection for the pilot or the gunner. The Po-2 was the primary aircraft of the infamous 588th Night Bomber Regiment of the Soviet Armed Forces. The Regiment, commonly nicknamed "Night Witches" was the only regiment in the world to entirely consist of females. The regiment was often looked down upon by their male counterparts, but as the Second World War raged, they earned the undying respect of the Soviet Army. Their nickname "Night Witches" comes from the characteristic sound of their Po-2's, that was all that could be heard during their nightly raids as their engines were set to idle and they would glide through to Night to their victims, completely silent. This sound, or lack thereof, brought their enemy's thoughts to the broomsticks of Witches and thus called them "Nachthexen". Which of course in English is "Night Witches"
Every single Night witch had by the end of the war flown at least 800 missions, which is completely unheard of. Especially considering that an American pilot was generally allowed to retire if he survived 25 missions. Some of the most famous Night Witches, Yekterina Ryabova and Nadezhda Popova are reported to once complete 18 Ground attack missions in a single night. Not only was it extremely humiliating for the German Army to be defeated by the Po-2, considering the fact that they used Me-109's and Focke-Wolf 190's. But the fact that they were females was even worse. It went to the degree that German High Command offered to give the Iron Cross to anyone that shot down a Night Witch. Only 30 people claimed that bounty in the entire war. Twenty Three Night Witches were awarded with the "Hero of the Soviet Union" title, 2 the "Hero of Russia" title and 1 the "Hero of Kazakhstan" title. 24,000 sorties and 23,000 tons of bombs dropped on target is also on their résumé. As the war went on and they became Heroes in the Soviet Union, they were offered better planes, but they refused. They stuck with the Po-2, they flew it when the war started and they flew it when they participated in the Battle of Berlin in '45. The Po-2 was used in the Korean War by the North Koreans, where it inflicted considerable damage against airbases. United Nations forces found it incredibly difficult to track and shoot down Po-2s, due to the wood and fabric construction of the plane that gave it a very small radar signature. The top speed of the Po-2 was well below the stall speed of most aircraft at the time. It is also the only biplane credited with a jet kill, when a Lockheed F-94 Starfire attempted to attack a low-flying Po-2 and stalled in doing so, losing control and crashing. The Po-2 could be obtained is the 2017 Halloween event, where the top 1,000 players in the ground and air events will earn the Po-2. The same could be said for the 2018 Halloween event, though only the top 1,000 players in the air races could earn the plane. This page was last edited on 4 February 2019, at 16:58.